China Holidays Blog: #ChinaHolidaysChat on Twitter! www.ChinaHolidays.co.uk organise bespoke tailor made itineraries and group tours to China. 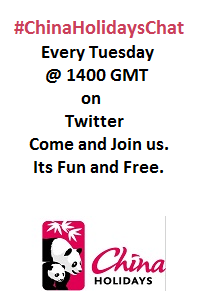 Tomorrow, the 14th August 2012 at 1400 GMT we are going to talk about Festivals in China. To join us, just add the #ChinaHolidaysChat hashtag to your Tweet to be included in the conversation. Please tweet your questions and we will answer them! information about travelling to China. ChinaHolidaysUK-2012. Simple theme. Powered by Blogger.